A boyhood dream has come true. I was interviewed by California School Business Magazine! I certainly sized the opportunity to pull no punches. I left no myth behind. Perhaps a few school business administrators will think differently about some of their decisions in the future. A PDF of the article is linked below. I hope you enjoy the interview and share it widely! 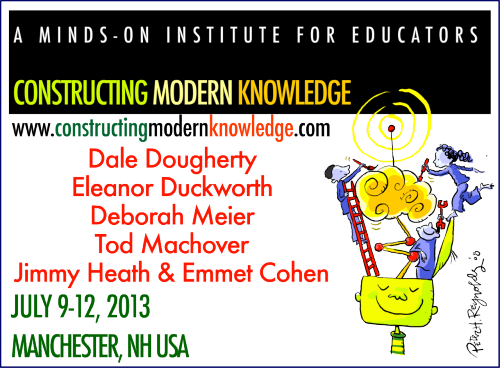 Those educators fortunate enough to attend Constructing Modern Knowledge 2013 will be greeted by an amazing faculty, world-class guest speakers, a mountain of LEGO, a plethora of electronics, piles of art supplies, a fully stocked library, assorted toys, tools and countless other objects to think with. The goal is to have anything a learner might need within reach of every CMK participant. In addition to ordering tons of microcontrollers, electronics kits and components from Sparkfun, Adafruit Industries, and Chinese LED sellers, the following is a sampling of the “stuff” one will find at the greatest professional learning event of the year. It’s not too late to register! Invent To Learn – Making, Tinkering, and Engineering in the Classroomby Sylvia Martinez and Gary S. Stager. $1,599This entry-level 3D printer has received stellar reviews. $6Lots of secret codes, tricks and disguises! $69.99This new 37 Modules Sensor Kit provides all kinds of funny and completed moduels for Arduino fans. These modules will output valuable signals directly by connecting Arduino boards. It is extremely easy for Arduino fancier to control and use these modules. This kit will help you control the physical world with sensors. $129I’ve lost several of these, one of my favorite cameras for little kids and shooting an hour of video on a charge. $399.99Gotta have it to capture all the fast-paced action! $13.50One of the best books about teaching and education reform I’ve read in many years! $8.99You can never have too many LEDs. We have thousands of them for all sorts of uses in Constructing Modern Knowledge and our new Invent To Learn workshops! $23.86The reference tool I’ve been waiting for! $45The new competitor to the Raspberry Pi in the sub-$50 computer market. $43.99The latest version of the Raspberry Pi computer. $19.43You need a multimeter if electronics projects are underway. On Stage CM01 Video Camera/Digital Recorder Adapter $9.95Turn a mic stand into a tripod! $129.99A complete inexpensive green screen studio in a bag! $32.95My #1 camera needs some really big fast RAM. $31Essential for stop-action animation projects and close-up photography. Everything folds up into a carrying case! $24.99A good quality all-purpose microphone. $15.85One genius controls an entire robot orchestra with a guitar! $44.17Kids have always made stuff. The difference between the Little Rascals and the maker movement is computation. $59A brilliant way to get started with e-textiles! This set contains everything you need for simple wearable computing projects. CMK needed a new projector! $195A fantastic portable amplifier and mixer. 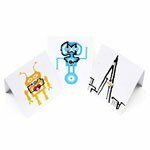 $24.95Make interactive electronic greeting cards out of paper! A classroom set for 30 kids is available for $90. Paint and markers for paper-based circuits. Wicked cool reusable connectors, hinges and child-safe saws for building cardboard constructions. Rolobox Reuseable Wheel Kit for Boxes $13.95Wheel sets for cardboard boxes. You need these with Makedo! $15.67A zillion high and low-tech project ideas and suggestions for amusing yourself. $13.92A full-color project book for learning Scratch programming. It even includes a chapter on using the external Picoboard! $16.25Really cool and beautifully photographed tech projects ideas for kids and adults alike. $18.97A new full-color guide to building machines out of LEGO Technic! Mechanical principles are explained clearly. This recent book about the Maker revolution is by the former editor of Wired Magazine. However, Neil Gershenfeld’s seminal book, Fab: The Coming Revolution on Your Desktop from Personal Computers to Personal Fabrication, does a better job of covering the “maker” revolution despite having been published in 2005. $60 – 70My late friend, Steve Ocko, invented this programmable floor turtle (robot) for Milton Bradley in 1979. There has never been a more powerful easy-to-use robot available for kids since.The good news is that some lunatic bought the rights to the Big Trak and is manufacturing new ones 30+ years later.Kids from 5+ will play and learn with Big Trak for ages. 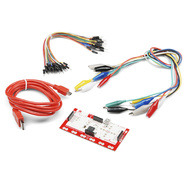 $49.95 – $59.95There’s no adequate way to explain Makey Makey, “the invention kit for everyone,” but you need to own at least one of them!Learn more here. $129.95An early-childhood robotics construction kit that may be controlled via Scratch. $36.24 (and worth it! )This fantastic book makes real mathematics come alive for kids (and teachers) grades 5 and up through the exploration of cryptography. There is plenty to keep you busy for years within this book. $14.66This book is filled with insanely creative ways to turn your photographs into amazing products and crazy ways to capture photographs you won’t believe. Fun for the whole family! Check out the exciting description of projects and photo techniques included in this unique book. $7.98Legendary educator and education author, Herb Kohl’s beautiful meditation on life, teaching, learning, art and aging. $20.06Herb Kohl & Tom Oppenheim interviewed some of today’s most prominent artists about the educational experiences that led them to their creativity and then leading educators responded to each interview. $10.85The first magnificent memoir by this Nobel-Prize winning physicist, raconteur and tinkerer. This is a must-read for anyone over twelve years of age. $18.69Parent activist Juanita Doyon offers practical advice for protecting your kids from destructive school policies like standardized testing. Read out latest newsletter for creative educators. There you will find other book reviews and recommendations for stimulating learning adventures! Add your email address to our mailing list for updates on CMK and for information on the forthcoming Los Angeles Education Speaker Series!